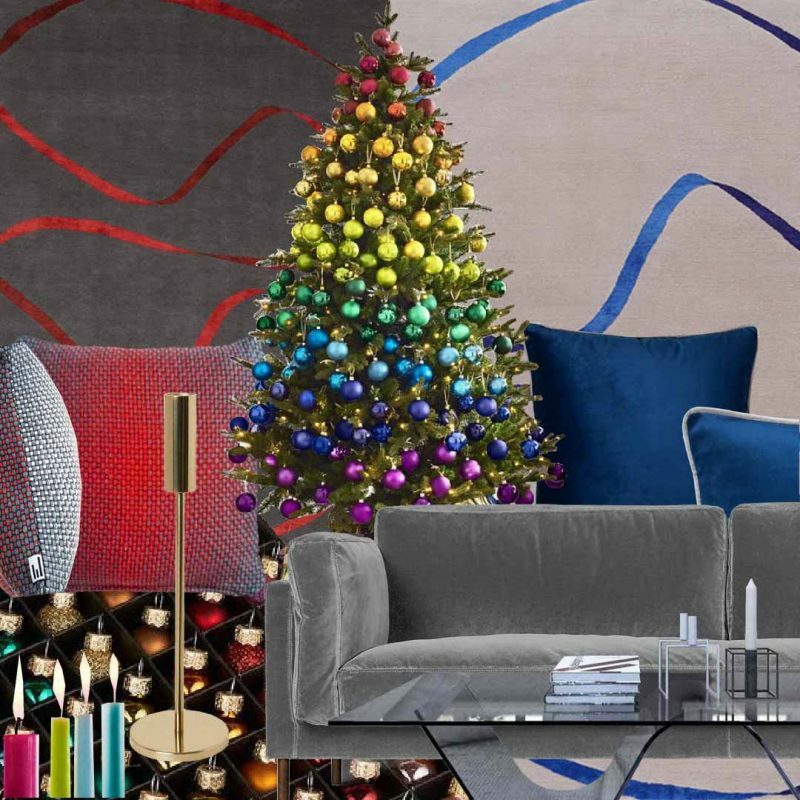 Read on for Edison’s festive advice using Deirdre’s STREAMER rug designs. As reported in House Beautiful and according to John Lewis, this year’s biggest Christmas decoration trend is to go full-out rainbow. Yes, think Joseph and his hyper-technicoloured dream-coat, think Wizard of Oz in HD, think saturation spectrum overload. This may be not be to everyone’s taste, but hey, Christmas is about having fun after all. Our STREAMER design in either colourway, would be a great companion to your rainbow inspired room. Linking up larger pieces of furniture and accessories by using just a limited colour palette, will give your decorations more impact. Pair the STREAMER carpet with a grey sofa such as this velvet beauty from Swoon, for deep seated luxury. Just add some colour coordinated cushions to complete the look. To get your tree looking its best, try decorating with this delightful box of glass baubles from John Lewis. For additional visual warmth group some gold candlesticks (H&M Home) and add to them hand-drawn, coloured candles from Shearer. When Christmas is over and those festive decorations are all packed and boxed away, your Streamer carpet can have all the attention back. Paired with an Onda curved glass coffee table from glassfurniture.co.uk will accentuate the curves of the flowing ribbons. The red and grey version of STREAMER is featured in the sample sale. Visit our website to take advantage of on-going sale offers, with an additional 5% taken off all sale prices from now until December 22nd, 2018.